It happened to me once before. In Cannes 1999, after seeing Chantal Akerman’s La captive, I said that I was not impressed, and I felt people looking at me strangely. For some critics (many of whom I respect very much), it was a masterpiece. According to a view of cinema that may not be popular, but is very deep and influential in cinephile circles, Akerman again proved with La captive that she was a major director. Philippe Garrel is also one of those figures: a director with fanatic followers in the most highbrow circles of film criticism. I had seen Sauvage innocence in Venice the year before. I hated it. Even more, I discarded it as a piece of serious filmmaking. I think it’s a kind of joke. But this thought leaves me in a position I don’t want to occupy. Am I a populist? No. Do I follow content and disregard form? No. Am I insensitive to the inner tension of a shot? By no means. Am I blind to beauty of black-and-white cinematography in its purest expression? I don’t think so, although my eyesight is not what it used to be. Am I against the stylised and distorted version of autobiography of which Garrel’s cinema is the perfect example? Not so far. But, why, for Mizoguchi’s sake, do this film and its admirers make me feel guilty of all these sins? I willingly concede some virtues of Sauvage innocence, including the elegance, the pace, the acting, and the distance. In fact, during the Venice screening, I had a wonderful time during the initial light and easy half-hour. In the film, a young director (Medhi Belhaj Kacem) wants to make a very personal anti-drug film about his past experience with his lover, a famous model who overdosed. (Everybody knows that Garrel lived with Nico and made an earlier film about their relationship, J’entends plus la guitare ). The director picks up a girl (Julia Faure) and offers her the leading part. He tries to raise money for his film with no success, until he meets a rich guy (Michel Subor) who becomes the producer. In the middle of the shooting, the producer blackmails the director, asking him to deliver a suitcase full of drugs in exchange for the money necessary to finish the film. And the director accepts. So, who is this character in Sauvage innocence? I mean the director, so simple-minded, so weak, and so stupid in the end. Garrel is supposed to be refined enough to be above the childish enterprise of his creature. So, maybe, he’s making a film about the frivolity of certain artists. But – and here comes my point – he wants to have it both ways. 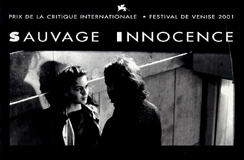 On one hand, Sauvage innocence is a film against drugs in the most conventional and reactionary way (if you don’t watch your loved ones close enough, they may succumb to the temptations of mean strangers – a slogan with which governments try to scare parents). On the other hand, Garrel is making fun of all of this. But his amusement doesn’t prevent him from killing people, showing that he knows everything about heroin, or suggesting absurd moral dilemmas. This kind of moral dilemma (“I can make this film against drugs if I help sell drugs”) is at the core of the most primitive Hollywood filmmaking. But something is wrong if a sophisticated director like Garrel indulges himself by messing with this cheap material. In a way, the depiction of intimacy with a twist of irony is a nouvelle vague device that goes back to À bout de souffle (1960). But after all these years, this particular mix of detachment and autobiographical narcissism that gave rise to dandyism has turned sour. In the beginning, there was a world outside and making films was a reaction to it. Now, there is no world left. It’s just a matter of solipsism, a game of certain individuals playing with their minds and memories, and a group of admirers celebrating. That’s why Sauvage innocence is an empty film. Quintín is the Director of the Buenos Aires Festival of Independent Cinema, and co-editor of El Amante. He recently wrote a chapter in the book Nuevo Cine Argentino (Fipresci Argentina and Editorial Tatanka), edited by Horacio Bernades, Diego Lerer and Sergio Wolf. The following piece appears in Senses of Cinema courtesy of Mark Peranson, editor of Cinema Scope (Canada).